Perpetual Guardian got plenty of news coverage last week after announcing that they would be trialling a four-day working week for all staff. At its core, its core they say it’s about improving staff motivation and productivity. In March, Perpetual Guardian, a firm which deals with wills and trust funds, will introduce a four-day week for a period of six weeks across the business of over 200 staff in a bid to measure what impact this will have on productivity within the company. Workers’ salaries will remain the same and the length of the workday will not be increased over the course of the six-week period. “We have seen cases where employees work longer hours for fewer days of the week or they earn 75 per cent of their full-time salary, but that is not what we are doing here,” says Perpetual Guardian founder Andrew Barnes. Perpetual Guardian head of people and capability Christine Brotherton pointed to international research showing a correlation between employee engagement and productivity. “If employees are engaged with their job and employer, they are more productive,” Brotherton said. Apart from hoping that the trial is a success and that my employer will follow suit, it did get me thinking about the potential impact this idea could have on congestion in Auckland if more businesses did the same. The Auckland Transport Alignment Project listed three key elements as part of its recommended strategic approach. One of those was to “Maximise new opportunities to influence travel demand“. Under that heading there were three areas focused on. We heard of progress on the last of those just last week. Understandably, fundamentally changing the structure of travel demand would have been out of scope. But that’s exactly what an idea like this, if adopted widely, could deliver. Mondays and Fridays would likely be the most popular extra days to take off but there would clearly be reduced demand on other days too. What would that do to graphs like this which predict the impacts of congestion? 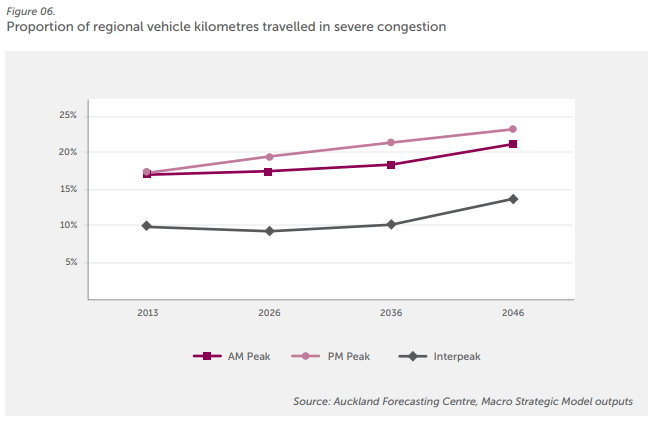 Could it be enough to shift peak congestion back to interpeak levels? More time off work and less time travelling when you are working. That’s a win win. Commuters aren’t the only ones that would benefit though. With less traffic the road transport industry would also benefit massively. Congestion has meant that trucks delivering stuff around Auckland now make fewer runs every day. So more trucks are needed to move the same amount of goods, but the latter is growing too. Having such a dramatic, cheap impact on demand could quickly change that. Let’s not forget the impact this could have on transport budgets. There’s currently an estimated $7 billion funding shortfall for transport projects over the next decade alone. Significantly reducing demand could allow some of the projects on the list to be pushed back a bit, easing pressure on the council’s books. Of course some of those projects may still be needed in the future as population growth and even induced demand from having less congested roads will eventually see levels back but this could give us some breathing space. Overall this are potentially huge implications for transport if an idea like this was able to get widespread adoption by NZ businesses. Perhaps transport agencies should consider how they could encourage other businesses to take it up. So let’s hope Perpetual Guardian’s trial is a raging success. Nothing new here. I used to work in the printing industry where 10 hour shifts four days a week or 12 hour shifts three days a week were the norm for big printers, and probably other manufacturing industries as well. My favourites were the 12 hour shifts, either 6 to 6 or 7 to 7 depending on the printer, three days on and four days off, Monday to Saturdays for day shifts and Sunday to Friday for night shifts. Some companies rotated their shifts, but most had static shifts. My favourite was the Wednesday to Friday night shift. I think this is new. Perpetual Guardian are proposing a reduction in work hours, 32 per week instead of 40, whereas I think you are talking about the same hours but worked over fewer days. Far simpler. Careless days. No flash new technology, just a simple windscreen sticker. Ok just as in the 70’s 10% of the population will rort the system however having the other 90% comply will have the desired effect. And if people move to being at work only 4 days per week in to comply all the better. That’s about as practical and realistic as jet packs and only half as cool. Most of my days are like that. The Wizard of Christchurch sold stickers for Careless Days. You could choose any day of the week as your careless day. Sam Hunt once said he got a carless day exemption by claiming he would be too drunk to know what day it was. I own two cars and a motorbike. I’ll just alternate. Easily possible for many in my street, with their multiple cars. Carless days were useful when households had one car, not three or four. A very blunt approach. We use our car most days, but often we don’t travel far so our impact on congestion is relatively small. We would end up having to buy a second car just to ensure we can continue to have this convenience. Working less would benefit families, lessen congestion, and most probably increase productivity and efficiency. Hence so much opposition to it. This is about occupying all of us until the day we shrivel up and die. That is why they call it a work life balance, as if somehow work preceeds life. If we all had more free time we might be more politically involved, contribute more to charity and voluntary causes, care a little more about the homeless and not allow inequality to continue to fester. Work less, live more, but that would upset the heirachy. I wonder what Bob Jones would say, actually, I don’t, it would anger me like his last effort. Agree. 8 hours work, 8 hours recreation, 8 hours sleep. OK, so I need more sleep than that. But the 8 hours’ work was supposed to include all work – cooking, laundry, growing food, teaching, caring. So many basic, normal things that we expect parents to do – growing a little of our own food, cooking from scratch, drying the clothes on the line and transferring to clothes horses, spending time in nature… but they get driven out by having to work 8 + hours per day and commute time on top of that. I am with a global consulting firm and the stuff that is being looked at in terms of day to day working is fascinating. Some of it is driven by the financials, others by the millenials (as well as those following – do they have a name?) and, of course, technology. Offices are already being remodelled and shrunk to push people to clients or working at home. 25% of the workforce will be independent contractors (usually alumni) on short term projects, to reflect their need for flexibility and the firms slow periods. Face to face working with colleagues will always be the bread and butter but technology allowing greater flexibility for remote working. I think this 4 day thing will become pretty popular and we’ll look back on it in 10yrs time and say why did we ever weight our week so heavily towards working. 4 days work/3 day weekend (for those that want it) will be the norm. I don’t think we will increase productivity massively (I mean we will work much longer in the 4 days, perhaps from home at the end) but overall it will be worth it. It will impact other things too – school and retail hours, especially the latter. Closing at 6pm? Crazy. You don’t have to. If you are productive and efficient, for many industries, you could do the same amount of work in four 8hr days as in five. That is what Perpetual is suggesting. What I meant is that, people being what they are, they will work a couple of extra hours a day rather than work at maximum efficiency. So kind of a compromise. Ultimately people will have the flexibility to do what suits their purposes (perhaps even remain at 5 days), but that flexibility will extend to working one less day, which is generally an option they don’t have now. Serious investigation should be made into making some real changes to the way of life in this country to address the massive deterioration in the quality of life and amount of free time people have to rest and do whatever. Throughout most of New Zealand’s history up until the 1990s it was possible for nearly everyone to be able to buy a home of their own and raise a family on one income with good wages and conditions on a 40 hour week, and nearly everyone had the weekends free with no retail trading on Sundays. Since the introduction of Sunday trading by the Labour Government in 1990 and the Employment Contacts Act by National Government in 1991, the New Zealand way of life has been in steady decline for many, with a massive reduction in pay rates and conditions relative to living costs, with things like penal rates removed, union presence and power in most workplaces reduced to almost nothing and many families having to have both parents work full time for longer hours, low wages with poor conditions, all the while housing prices have steadily increased to the point of being unaffordable for an increasing many with house prices at around ten times the average income. Many people are having to work up to 6 and 7 days per week with long commutes and still no real hope of ever buying a home of their own or having much free time to spend with friends and family and enjoy all the things this country has to offer. In this time period traffic congestion has significantly increased in our main centres and on our main arterial roads, ‘driven’ by higher house prices and rents forcing people to live further afield from where they work and having to drive in the absence of decent public transport until very recent years, and NZ’s move from a transport system which used to heavily rail based until the 1980s, to one which is now heavily road based. Serious study and investigation should be made of countries which have a high standard of living and a relatively good work / life balance, long life expectancy etc, such as many countries in Europe. Consideration should be made to allow greater flexablity of days and hours as proposed in this post. Consideration should also be made to change current standard school and retail opening hours. Have schools start and shops open at 10am and have schools finish at 4pm and shops close at 6pm so as to stagger and thin peak periods out and allow people more time to sleep in the mornings, particularly during hot humid weather we get in NZ during the summer, which will help students concentrate better at school and help improve performance of both students and people working. The new Labour-NZ First-Greens Government has a lot of potential to make much needed changes to NZ society and to bring NZ up to date with the needs of the people and country in 2018 and to improve the quality of life and work / life balance. While I agree with your sentiments around work life balance, I think you are contradicting yourself when you say we should have more flexibility in when we work but also saying that businesses should be required to close on a Sunday. I imagine there are many people who quite enjoy being able to work on the weekend and have days off during the week. What needs to change is the balance between employees and employers so more workers get the hours they like rather than what they are told. This will work well for some. It will not work well for the people who need it the most or have the least bargaining power. When I decided to do four day working weeks I opted to take Wednesdays off. That way the worst I ever have to face is two days working at a stretch. I only get 80% of the money but since that whole extra day is taxed at the high rate the impact on net income isn’t so bad. I view it as a perfectly legal way to reduce my tax. Don’t work as much. Works well until redundancy hits. 80% payout. Oh dear, how sad, never mind. A friend, approaching retirement, negotiated hard for a 4 day week (he chose Wednesday too). Not long after, was made redundant to his great surprise (and delight). But win-win in his case as he probably wouldn’t have qualified at his salary otherwise. Miffy, I do the same when I can for the same reason. Two day in a row at most. Amazing how liberated your weekends can become when you have half a day mid week to do errands and stuff. I propose we close all schools permanently as during the school holidays the traffic is so much better. This idea comes hot on the heels of firms that offer “unlimited leave”. Only problem is what this actually means is that you can take leave when you have a gap in your workflow. The actual reality beyond the fancy headlines is that unlimited annual leave is almost never taken because the employees never have a chance to take the leave. Likewise the 4-day week will be a fad. Unless the staff are as lazy as hell they clearly aren’t going to achieve the same level of work over reduced hours. It should also be noted from a transportation perspective that this could well be a negative. Hardly anyone catches PT in the weekends because it doesn’t go to places where people actually spend their weekends. So if people have more recreation time we could well see an uptick in car usage. A fad comes and goes. This will be permanent, but an option nonetheless. if People want it, they’ll work for it. Its just another piece of the “workplace flexibility” approach which many industries are offering. In NZ, shops closes at the same time people finish work at 9-5. Working people can’t do shopping, go to bank, see lawyers etc afterwork. This is quite inconvenient for most people. This is also inefficient as shops become very busy during lunch hours but not so busy other times. In other countries, consumer retail starts 11am and finish 10pm for 7days a week, It is uncommon for people to work 10 hours a day for only 4 days per week. Some people can work the morning shift, some can do afternoon shift. This flexibility allows people to have a 3 week holiday every week and they can take day off in weekdays to go to bank or see lawyers. Alternativly people can take care of the children in the morning and work at night. It would be a win win. It is quite ridiculous to see Farmers on queen street to close at 6pm Friday night, where city is still full of people looking to spend some money. This is a cultural thing too – we don’t make use of, nor do we have the opportunity for using our nights for anything other than entertainment. There are very limited study options, as our institutions and their hours are set up around full time students. Often after-work tertiary study is angled at upskilling yourself in your current industry (e.g. MBA classes) and there are very few opportunities to completely retrain. Once upon a time, not that long ago, only dairies were allowed to be open on Sundays. Even a slightly larger grocery store needed to pull a curtain to hide those items that weren’t approved dairy items. Highly prescriptive. Tell you what, though, families generally did things together on a Sunday, including physical activity. There was so much less traffic some people actually chose to go for a Sunday Drive. It was a day for fixing instead of buying to replace. Not suggesting we go back there, but only because it would be a waste of energy trying. It seemed like everything was closed in Germany on Sundays. At least when I was last there a few years ago. I was annoyed at first, but then realised it was just their culture that had been in place for a very long time and showed what they valued as a culture. I saw families cycling around, walking in the parks spending time together. And their economy is doing just fine. In the OECD, Germans work the least and are the most productive with their time. We are the opposite, we work a lot and don’t produce much. Unfortunately, today it’s not so easy to find a well-paid work with great career opportunities in NZ. Remember when I just moved to NZ a few years ago I had been looking for a new job in Information Technology Division for a few months before I found Potentia recruitment company. I always wanted to make a career in IT and with their help I’ve finally got what I was looking for. Now I work as Research Analyst in local IT company in Auckland.